Purchse one (1) Keiki Pony Ride for Half Price! 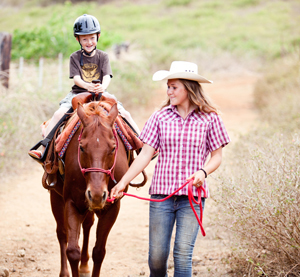 Keiki Pony Rides at Gunstock Ranch! Looking for an adventure your child will never forget? 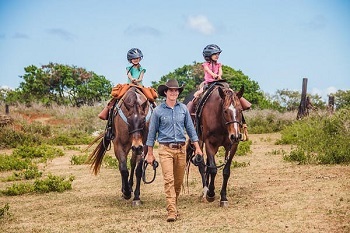 Gunstock Ranch offers Pony Rides on our beautiful ranch in Kahuku, Oahu that provide kids with a safe and fun experience they will remember for a lifetime.The Pony Ride for Kids is a 30-minute “horse experience” that is ideal for children between the ages of 2-7 years old. Children 6 and under will be lead or “ponied” by a wrangler. Older children or even adults are welcome to purchase one of these experiences too if they want to ride a horse alongside their child. Children are allowed to feed and pet their horse after they are put in the saddle and taken on a 20 minute walk out on the ranch. Parents are welcome to walk alongside their child and take pictures along the way (at no charge). Ride time is set to your availability. 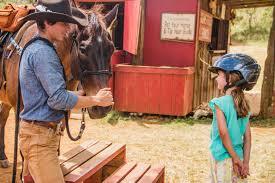 This is a fun experience to allow a young child the opportunity to ride a horse in a safe and controlled setting. Up to 2 keiki can be booked for the same ride. Please check in 30-minute before your ride time. There will be a 15-minute safety briefing prior to the ride. Our goal is to leave on time so we provide you the full experience. Please plan ahead so you are not late as it will affect your tour length. Gunstock Ranch is located 2 miles north of the Polynesian Cultural Center, between the towns of Laie and Kahuku, Oahu. We are a 10-minute drive from Turtle Bay Resort. • Rescheduling/Canceling with more than 24 hours will be rescheduled based on availability. • Rescheduling/Canceling with LESS than 24 hours will not be rescheduled nor refunded. • Reschedules with less than 24 hours may be accommodated when possible with a $15 fee. • We are CLOSED on Sunday, so Cancellations for Monday rides must be made by Saturday at 5:00 pm. • We ride rain or shine. However, in the event we cancel a ride due to conditions we feel are unsafe for our trails, no charges will be applied and ride will be rescheduled. • If a party calls in to cancel their ride because they don’t want to ride in the rain, and we plan to carry out the ride, no refund will be given. • No Shows will not be rescheduled nor given a refund. Up to 2 orders can be purchased, only 2 rides per booking, Blackout dates:12/24 - 1/2, Riders must be over 7 years old. Our weight limit for any rider is 240 lbs. Must check in 30 minutes before your rides' start time. Each rider must attend a 15-min safety briefing prior to riding, Arriving late for your tour will affect your tour length. All tours need to end at the scheduled time. It is your responsibility to ensure you have proper directions to our location.